For the silent romantic comedy, see Manhattan (1924 film). Manhattan is a 1979 American romantic comedy film directed by Woody Allen and produced by Charles H. Joffe. The screenplay was written by Allen and Marshall Brickman. Allen co-stars as a twice-divorced 42-year-old comedy writer who dates a 17-year-old girl (Mariel Hemingway) but falls in love with his best friend's (Michael Murphy) mistress (Diane Keaton). Meryl Streep and Anne Byrne also star. Manhattan was filmed in black-and-white and 2.35:1 widescreen. The film features music composed by George Gershwin, including Rhapsody in Blue, which inspired the idea behind the film. Allen described the film as a combination of his previous two films, Annie Hall and Interiors. The film was met with widespread critical acclaim and was nominated for two Academy Awards: Best Supporting Actress for Hemingway and Best Writing, Screenplay Written Directly for the Screen for Allen and Brickman. Its North American box-office receipts of $39.9 million made it Allen's second biggest box-office hit (after adjusting for inflation). Often considered one of Allen's best films, it ranks 46th on AFI's 100 Years...100 Laughs list and number 63 on Bravo's "100 Funniest Movies". In 2001, the United States Library of Congress deemed the film "culturally significant" and selected it for preservation in the National Film Registry. The film opens with a montage of images of Manhattan and other parts of New York City accompanied by George Gershwin's Rhapsody in Blue, with Isaac Davis (Woody Allen) narrating drafts of an introduction to a book about a man who loves the city. Isaac is a twice-divorced, 42-year-old television comedy writer who quits his unfulfilling job. He is dating Tracy (Mariel Hemingway), a 17-year-old girl attending the Dalton School. His best friend, college professor Yale Pollack (Michael Murphy), married to Emily (Anne Byrne), is having an affair with Mary Wilkie (Diane Keaton). Mary's ex-husband and former teacher, Jeremiah (Wallace Shawn), also appears, and Isaac's ex-wife Jill Davis (Meryl Streep) is writing a confessional book about their marriage. Jill has also since come out as a lesbian and lives with her partner, Connie (Karen Ludwig). When Isaac meets Mary, her cultural snobbery rubs him the wrong way. Isaac runs into her again at an Equal Rights Amendment fund-raising event at the Museum of Modern Art hosted by Bella Abzug (playing herself) and accompanies her on a cab ride home. They chat until sunrise in a sequence that culminates in the iconic shot of the Queensboro Bridge. In spite of a growing attraction to Mary, Isaac continues his relationship with Tracy but emphasizes that theirs cannot be a serious relationship and encourages her to go to London to study acting. In another iconic scene, at Tracy's request, they go on a carriage ride through Central Park. After Yale breaks up with Mary, he suggests that Isaac ask her out. Isaac does, always having felt that Tracy was too young for him. Isaac breaks up with Tracy, much to her dismay, and before long, Mary has virtually moved into his apartment. Emily is curious about Isaac's new girlfriend. The two couples enjoy a day out and upon walking down a street Isaac spots Jill's new book Marriage, Divorce, and Selfhood. Emily proceeds to read parts of the book aloud, including passages about a ménage à trois Isaac had with Jill and another woman, and an incident where Isaac attempted to run Connie over, much to Mary and Yale's amusement. Thoroughly humiliated, Isaac confronts Jill, who responds stoically and mentions a film rights deal she has acquired. Upon returning home, Isaac learns from Mary that she is returning to Yale and wants to break up. A betrayed Isaac confronts Yale at the college where he teaches, and Yale argues that he found Mary first. Isaac discusses Yale's extramarital affairs with Emily and learns that Yale told her Isaac introduced Mary to him. In the dénouement, Isaac lies on his sofa, musing into a tape recorder about the things that make "life worth living". When he finds himself saying "Tracy's face", he sets down the microphone. Unable to reach her by phone, he sets out for Tracy's on foot. He arrives at her family's apartment building just as she is leaving for London. He asks her not to go and says he does not want "that thing about [her] that [he] like[s]" to change. She replies that the plans have already been made and reassures him that "not everybody gets corrupted" before saying "you have to have a little faith in people." He gives her a slight smile, with a final coy look to the camera then segueing into final shots of the skyline with some bars of Rhapsody in Blue playing again. An instrumental version of "Embraceable You" plays over the credits. According to Allen, the idea for Manhattan originated from his love of George Gershwin's music. He was listening to one of the composer's albums of overtures and thought, "this would be a beautiful thing to make ... a movie in black and white ... a romantic movie". Allen has said that Manhattan was "like a mixture of what I was trying to do with Annie Hall and Interiors." He also said that his film deals with the problem of people trying to live a decent existence in an essentially junk-obsessed contemporary culture without selling out, admitting that he himself could conceive of giving away all of his "possessions to charity and living in much more modest circumstances," and adding that he has "rationalized [his] way out of it so far, but [he] could conceive of doing it." According to actress Stacey Nelkin, Manhattan was based on her romantic relationship with Woody Allen. Her bit part in Annie Hall ended up on the cutting-room floor, and their relationship started when she was 17 years old and a student at New York’s Stuyvesant High School. Allen did not publicly acknowledge the relationship until 2014. Allen talked to cinematographer Gordon Willis about how fun it would be to shoot the film in black and white, Panavision aspect ratio (2.35:1) because it would give "a great look at New York City, which is sort of one of the characters in the film". Allen decided to shoot his film in black and white because that was how he remembered it from when he was small. "Maybe it's a reminiscence from old photographs, films, books and all that. But that's how I remember New York." He always heard Gershwin music with it, too. In Manhattan he really thinks that he and Willis succeeded in showing the city. "When seeing it there on that big screen, it's really decadent". The picture was shot on location with the exception of some of the scenes in the planetarium which were filmed on a set. The famous bridge shot was done at five in the morning. The production had to bring their own bench as there were no park benches at the location. The bridge had two sets of necklace lights on a timer controlled by the city. When the sun came up, the bridge lights went off. Willis made arrangements with the city to leave the lights on and that he would let them know when they got the shot. Afterwards, they could be turned off. As they started to shoot the scene, one string of bridge lights went out, and Allen was forced to use that take. After finishing the film, Allen was very unhappy with it and asked United Artists not to release it. He offered to make a film for free instead. He later said: "I just thought to myself, 'At this point in my life, if this is the best I can do, they shouldn't give me money to make movies.'" All titles of the soundtrack were compositions by George Gershwin. They were performed by the New York Philharmonic under Zubin Mehta and the Buffalo Philharmonic under Michael Tilson Thomas. "Land of the Gay Caballero"
A part of the first movement of Mozart's Symphony No. 40 is heard in a concert scene. Manhattan opened in 29 North American theaters on April 25, 1979. It grossed $485,734 ($16,749 per screen) in its opening weekend and earned $39.9 million in its entire run, making the film the 17th highest-grossing picture of the year. The film was shown out of competition at the 1979 Cannes Film Festival in May. Adjusted for ticket price inflation (as of 2017), Manhattan grossed $141,484,800, making it Allen's second biggest box-office hit, following 1977's Annie Hall. The film received largely positive reviews and currently holds a rating of 95% "Certified Fresh" on Rotten Tomatoes based on reviews from 59 critics. Gary Arnold, in The Washington Post, wrote: "Manhattan has comic integrity in part because Allen is now making jokes at the expense of his own parochialism. There's no opportunity to heap condescending abuse on the phonies and sellouts decorating the Hollywood landscape. The result appears to be a more authentic and magnanimous comic perception of human vanity and foolhardiness." In his review for Newsweek magazine, Jack Kroll wrote: "Allen's growth in every department is lovely to behold. He gets excellent performances from his cast. The increasing visual beauty of his films is part of their grace and sweetness, their balance between Allen's yearning romanticism and his tough eye for the fatuous and sentimental – a balance also expressed in his best screen play [sic] yet." In his review for the Chicago Sun-Times, Roger Ebert, who gave the film three-and-a-half stars out of four, wrote, "Diane Keaton gives us a fresh and nicely edged New York intellectual. And Mariel Hemingway deserves some kind of special award for what's in some ways the most difficult role in the film." Ebert included the film in his list of The Great Movies. Gene Siskel of the Chicago Tribune awarded a full four out of four stars, calling it "a remarkable motion picture. 'Manhattan' may turn out to be the year's best comedy and drama." Vincent Canby of The New York Times called the film "extraordinarily fine and funny" with "superb" performances from Keaton and Hemingway. Charles Chaplin of the Los Angeles Times called it "harder, harsher, crueler, deeper-going, more assertive but in the end no less life-affirming than 'Annie Hall,'" and declared Manhattan "even better" than that film. Alexander Walker of the London Evening Standard wrote: "So precisely nuanced is the speech, so subtle the behaviour of a group of friends, lovers, mistresses and cuckolds who keep splitting up and pairing off like unstable molecules". In 2007, J. Hoberman wrote in The Village Voice: "The New York City that Woody so tediously defended in Annie Hall was in crisis. And so he imagined an improved version. More than that, he cast this shining city in the form of those movies that he might have seen as a child in Coney Island—freeing the visions that he sensed to be locked up in the silver screen." In October 2013, readers of The Guardian newspaper voted it the best film directed by Woody Allen. New York Film Critics Circle named Allen best director for Manhattan. The National Society of Film Critics also named Allen best director along with Robert Benton, who directed Kramer vs. Kramer. The film was nominated for Academy Awards for Best Supporting Actress (Mariel Hemingway) and Best Original Screenplay (Allen and Marshall Brickman). It also won the BAFTA Award for Best Film. In Empire magazine's 2008 poll of the 500 greatest movies ever made, Manhattan was ranked number 76. The film was number 63 on Bravo's "100 Funniest Movies". In 2001, the United States Library of Congress deemed it "culturally significant" and selected it for preservation in the National Film Registry. It is also ranked #4 on Rotten Tomatoes' 25 Best Romantic Comedies. Allen wanted to preserve Willis's compositions and insisted that the aspect ratio be preserved when the film was released on video (an unusual request in a time when widescreen films were normally panned and scanned for TV and video release). As a result, all copies of the film on video (and most television broadcasts) were letterboxed, originally with a gray border. 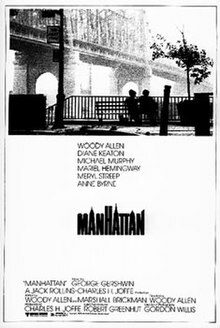 Manhattan was first released on Blu-ray on January 24, 2012, alongside Allen's 1977 film Annie Hall. Both releases included the films' original theatrical trailer. Manhattan's screenplay was performed in front of a live audience at the Los Angeles County Museum of Art on November 15, 2012, as part of Jason Reitman's Live Read series. Actors read the script, narrowed to six speaking parts, and still photographs from the movie were projected behind them. The cast included  Stephen Merchant as Isaac Davis, Olivia Munn as Mary Wilkie, Shailene Woodley as Tracy, Michael Murphy as Yale Pollack, Mae Whitman as Emily Pollack, Erika Christensen as Jill Davis and Jason Mantzoukas as Dennis. In keeping with the project's focus on impermanence and spontaneity, there were no rehearsals, shows were announced only days prior, and the names of some cast members were withheld entirely; performances were not recorded. Manhattan inspired the song "Remember Manhattan" written by Richard Marx and Fee Waybill from Marx's debut album. ^ Box Office Information for Manhattan. The Wrap. Retrieved April 4, 2013. ^ "Box Office Information for Manhattan". Box Office Mojo. Retrieved January 28, 2012. ^ "Anne Byrne Hoffman". IMDb. ^ Rich, Frank (April 30, 1979). "An Interview with Woody". Time. ^ "Stacey Nelkin: Actress, Sexpert – The Howard Stern Show for April 7, 2011". April 7, 2011. ^ Allen, Woody (Feb 7, 2014). "Woody Allen Speaks Out". New York Times. Retrieved Feb 13, 2014. ^ a b Willis, Gordon (April 6, 2004). "Made in Manhattan". Moviemaker. Retrieved December 5, 2014. ^ a b Weide, Robert B. (Director) (2011). Woody Allen: A Documentary (Television). PBS. ^ "Manhattan". Box Office Mojo. May 2, 1979. Retrieved January 11, 2007. ^ "Festival de Cannes: Manhattan". festival-cannes.com. Archived from the original on January 18, 2012. Retrieved May 25, 2009. ^ "Woody Allen Movie Box Office Results". Box Office Mojo. Retrieved 2017-09-28. ^ "Manhattan". Rotten Tomatoes. May 2, 1979. Retrieved May 27, 2009. ^ Arnold, Gary (May 2, 1979). "Woody Allen's Comic High: A Delightful and Deluxe Rhapsody of Wry Romance". The Washington Post. ^ Kroll, Jack (April 30, 1979). "Woody's Big Apple". Newsweek. ^ Ebert, Roger (January 1, 1979). "Manhattan". Chicago Sun-Times. Retrieved January 11, 2008. ^ Ebert, Roger (March 18, 2001). "Great Movies". Sun-Times. ^ Siskel, Gene (May 11, 1979). "Comedy, drama have a good relationship in Allen film". Chicago Tribune. Section 3, p. 1. ^ Canby, Vincent (April 25, 1979). "The Screen: Woody Allen's 'Manhattan'". The New York Times. C17. ^ Champlin, Charles (April 22, 1979). "'Manhattan': Allen's Dark Comic View". Los Angeles Times. Calendar, p. 1. ^ Hoberman, J (July 10, 2007). "Defending Manhattan". The Village Voice. Archived from the original on July 14, 2007. Retrieved July 11, 2007. ^ "Kramer vs. Kramer selected best film". The Globe and Mail. December 21, 1979. ^ Arnold, Gary (January 3, 1980). "Film Critics' Pick of the Year". The Washington Post. ^ Arnold, Gary (February 26, 1980). "Kramer, Jazz Lead Nominees". The Washington Post. ^ "Empire's 500 Greatest Movies of All Time". Empire. Archived from the original on 2012-10-21. ^ "25 Best Romantic Comedies". Rotten Tomatoes. 2009. Retrieved February 12, 2009. ^ "AFI's 100 Years...100 Movies Nominees" (PDF). Retrieved 2016-08-06. ^ "AFI's 100 Years...100 Passions" (PDF). American Film Institute. Retrieved 2016-08-06. ^ "AFI's 100 Years...100 Movie Quotes Nominees" (PDF). Retrieved 2016-08-06. ^ "AFI's 100 Years...100 Movies Nominees (10th Anniversary Edition)" (PDF). Retrieved 2016-08-06. ^ a b Nashawaty, Chris (January 24, 2012). "Annie Hall Review". Entertainment Weekly. Retrieved July 19, 2012. ^ "Jason Reitman to re-create Woody Allen's Manhattan in live-read event" by Anthony Breznican, Entertainment Weekly, November 9, 2012. Retrieved August 31, 2013. ^ "Jason Reitman to Live Read Manhattan in L.A.", The Woody Allen Pages, November 10, 2012. Retrieved August 31, 2013. ^ "Stephen Merchant and Olivia Munn Starred in Jason Reitman's Manhattan Live Read", The Woody Allen Pages, November 18, 2012. Retrieved August 31, 2013. ^ "Jason Reitman Brings Memorable Movies to Life at LACMA", by Katherine Tulich. The Los Angeles Times, January 19, 2012. Retrieved August 31, 2013. Baxter, John (1999). Woody Allen: A Biography (Revised paperback ed.). London: Harper Collins. ISBN 0-00-638794-2. Bjorkman, Stig (1995) . Woody Allen on Woody Allen. London: Faber and Faber. ISBN 0-571-17335-7. Brode, Douglas (1987). Woody Allen: His Films and Career. Citadel Press. Fox, Julian (1996). Woody: Movies from Manhattan. Overlook. Palmer, Myles (1980). Woody Allen. Proteus. This page was last edited on 30 March 2019, at 07:41 (UTC).